Early Tuesday morning I received the news that my grandma had passed away. It's emotional losing anyone you're close to, and naturally your mind starts to wander around the last things you said, your visits, the relationship you had. Having just seen her a few weeks ago in good spirits I'm actually most thankful that my final memories of her are positive ones surrounded by family. 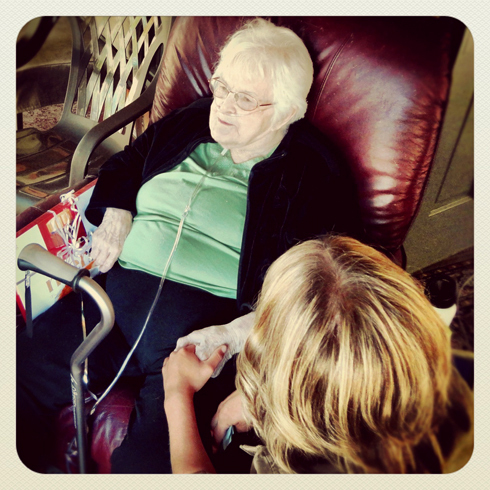 When I shared a bit from our brief afternoon reunion that took place on July 29, it seemed poignant to write about it at the time because my grandma had just been accepted into an extended care facility. It felt like a lot of goodbyes were being said then as everyone wrestled with this being a final step in preparation of the inevitable. No one could have known that only a week after moving out of the house that she would pass. Life is strange like that. The last picture I snapped of Grandma and me. There's poetry in the fact that we all came together when we did for that visit. For me (because it was the last time I saw her), it makes me feel like I had time on my side. In the past I've worried about months going by without seeing my grandma and thinking I might accidentally miss my chance. Truthfully, we should all be so lucky to realize that the final moment we shared with someone we loved ended on a high note. As I sat next to Grandma for a bit that afternoon we didn't talk about anything out of the ordinary really. She questioned me about the concrete whale post I had sent her and whether I'd been able to find out anything else. I hadn't. She had a white board and marker next to her to make communicating easier as her hearing had become increasingly worse. I tried to write out a few of the details. She seemed to enjoy a lot of my recent pictures from around Medicine Hat largely because I think she had resigned to the fact that she'd never see it in person again. On a visit last year I brought a few of the photo books I'd made of my road trips to California and I'd never sat with anyone who was more intent on asking about the details and history of each location. That was Grandma to me. Someone always interested in a good picture, a strange story, a bit of history, etc. It felt nice to share that with her as I know her approach has become familiar territory in regards to what I do now. I have memories of Grandma welcoming us at the door and then disappearing into the back of the house only to reemerge with magazines, or clippings, or some unusual toy that she'd come across. She stashed stories in anticipation of visitors, which was amazing, because it meant she always had something to share. Grandma was always good at making you feel important just for being there, and you'd know that because she usually did all of the talking. Back to the start. 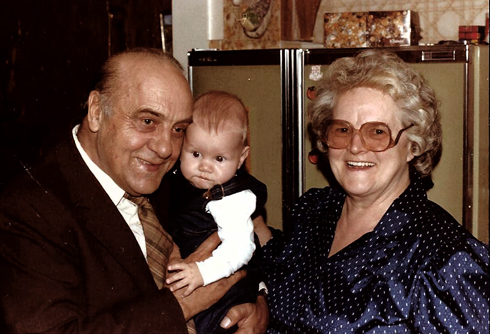 Me with Grandma and Grandpa in 1985. My sister holding Grandma's hand. One of the last things we had talked about that afternoon was our last name. Grandma always liked to remind me that I am the only male in line to carry on the Fandrich name. Of her five kids (three of which were boys) my dad was the only one to have a son. It was a pretty tongue and cheek reminder (as it always was), but she made sure the point never eluded me. I could always count on Grandma for a bit of casual ribbing. In the end, things truly won't ever be quite the same. 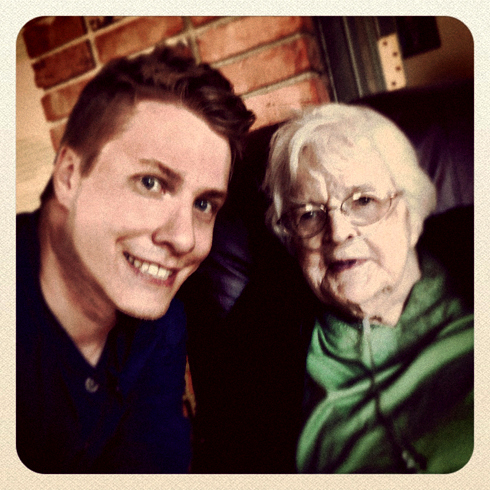 She was my last grandparent, and a meaningful link to my childhood. No story from my youth is complete without recalling how I'd burn sticks of spaghetti on the stove while she babysat me and my sister. Or, how we'd get our feet washed in the sink after playing barefoot on the kitchen floor. Trips to the candy store, camping, bocce ball, Sunday visits, Christmas dinners, and so on, all paint a vivid picture for me of what I knew to be an ideal grandparent. My cousin Leslie also shared some memories and sentiments about our Grandma. She wrote a beautiful tribute that can be read here. 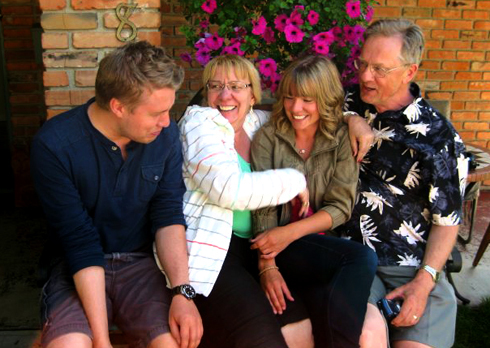 In recent years she was a magnet for the extended family to centre around. At 88 years old you can't help but think she did pretty well, and how lucky we all were for it. I'll miss her. She made sure the first 28 years of my life were a little more interesting, a little more entertaining, and without question, a little more loved. 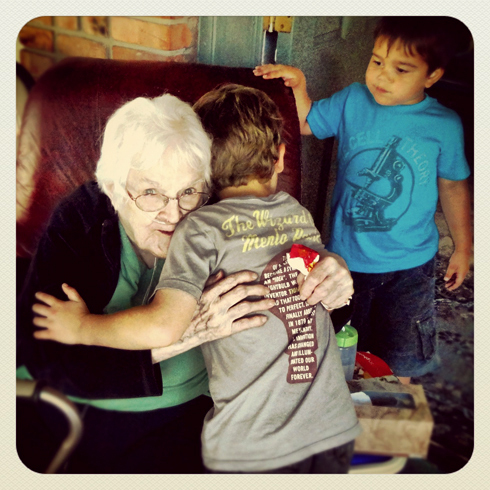 Hugs from the great grandkids. I love this picture my aunt snapped of our family that afternoon. 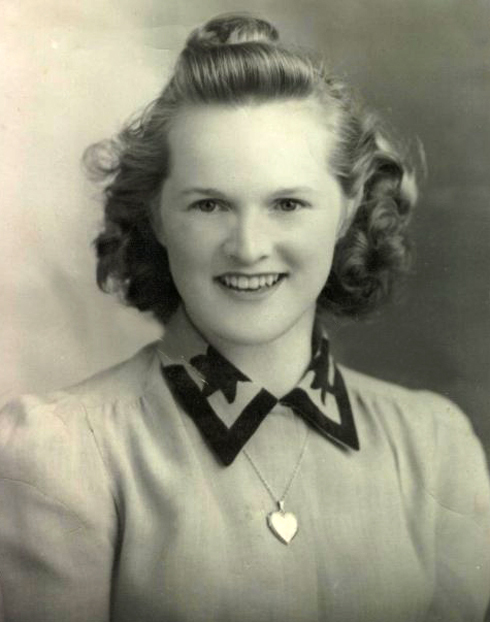 A picture I found of Grandma from 1943. In all the time I have blogged there has been two pieces I wrote that I think about all the time. They seem to be closer to my heart than anything I have ever written. They are the ones I wrote after my Grandpa and GreatGrandpa passed. If I put them up to all the creative works I have done (written/video/whatever) they are definitely the top two but creative doesn't seem to do them justice. I'm proud that it was my heritage. I suspect this post and pictures will be likewise for you. I send my regards Luke. Thanks, M. Yes, I'm happy that posts like this will always help me remember and honor a woman who was very important in my life.